RowPro connects to your Concept2 Performance Monitor (PM) with a standard USB printer cable. When you start RowPro, you just choose the row you want from a list, and click or tap Row. RowPro then sets up the row directly onto your Concept2 PM, and you can start rowing. This hugely expands the type of workouts you can set up and row, plus it saves you any fumbling with the buttons on the Concept2 PM. RowPro also enables you to add a warm-up and/or warm-down to each row, plus you can adjust the number of splits RowPro automatically records. All this gives you full control over your rowing, and a fast and easy way to set up exactly the workout you want. 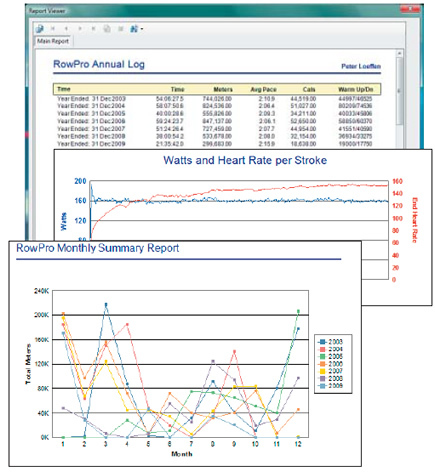 RowPro automatically saves detailed results of every row into your RowPro online logbook. But this is no ordinary logbook - it's a Rowlog™ that records time, distance, pace, watts, cals, stroke rate and heart rate for every stroke of every row. 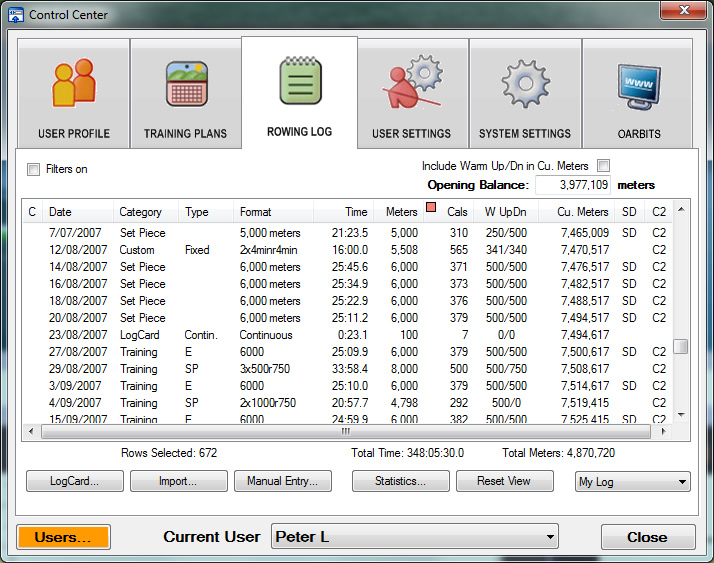 This base of detailed rowing data forms the core of RowPro's powerful tracking, statistics and analysis capability. Each row becomes a single line in your Rowlog so you can easily see and find it later. You can sort and filter your Rowlog entries, and with a single click you can view a report for each row showing totals, splits, intervals and strokes. You can also upload results directly from your RowPro online logbook to your Concept2 Online Logbook - this is one of the most popular features, and especially handy if you’re participating in one of the Concept2 challenges or million meter clubs. Reports that show details of each row: per split, per interval and per stroke. Analysis reports that show how two sessions compare so you can quickly check your progress at-a-glance. 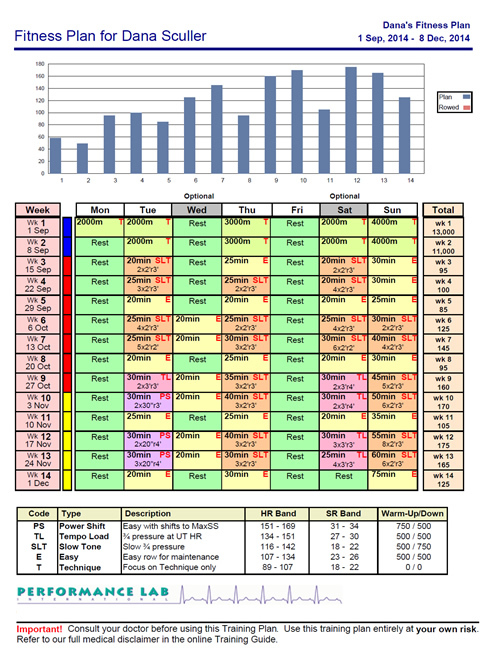 Statistical reports that summarize your rowing weekly, monthly and annually. You can also export results as XML Rowfiles or as CSV files for more specialized analysis, for example using Excel. All this gives you the visibility you need, to confirm that you're making the progress you want towards your rowing goals. RowPro has a lifetime supply of well-structured training plans ready for you to use. But these are no ordinary training plans - they are Rowplans™ that are expertly tailored to your personal capability and goals by RowPro. Our Rowplans are created by training guru Jon Ackland of Performance Lab International. This means each Rowplan is technically sound and 100% based on exercise science. Manageable weekly volumes (total meters or minutes). Multi-day cycles of directed effort, easy rowing and rest. Multi-week cycles of strength, endurance and speed workouts. Workouts that are based on heart rate and stroke rate targets, not pace targets. But most importantly, the online Training Plan Wizard built into RowPro tailors each Rowplan to you. This is critical, because unless training plans are specifically tailored to your physiology and training goals, they are almost certain to be sub-optimal and may not be safe for you. Using the Wizard, you can select from over 600 Rowplans for health and fitness, weight control, or competition at all levels. Rowplans are available for the full spectrum of users from beginner to elite, and each Rowplan can run for 8, 10, 12 or 14 weeks to fit your busy schedule. RowPro sets up each Rowplan workout onto your Concept2 PM ready for you to row, and then records the results directly from the monitor into your personal Rowlog. Later, you can review any training workout to see how you did, and compare that to other similar workouts to see how you're progressing towards your goals. By bringing all this together into an integrated easy-to-use training system, RowPro takes the guesswork out of your rowing and puts you in control, so you can be confident you'll get the outcomes you want from your rowing. 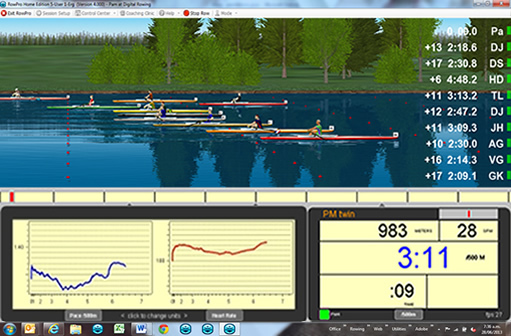 Online Rowing is connecting your RowPro computer to the Internet and rowing with other people anywhere in the world, live and in real time. 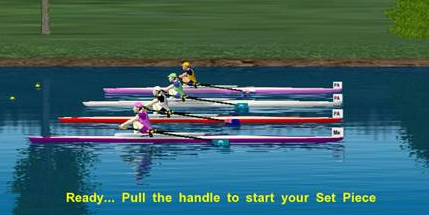 From the warm welcome when you first go online to the friendly banter after each online row, you’ll instantly appreciate how much fun and motivation you get rowing online with others. And that’s what keeps you rowing. Fun. Company. Friendships. It's pure motivation. You don’t need to care about the technology that makes it possible, nor think about the way it all comes together across the globe. You just go online and row. There are so many online rows you can join - everything from general fitness to handicap fun races to the hugely popular birthday celebration rows, it’s all there ready for you to join. People are having a ball rowing online, and it shows. People in over 40 countries row online in all the time zones from Europe to New Zealand. Over 1 billion meters have been rowed online already. There are many online rows every day that anyone can join. It’s free to all RowPro users. Any Internet connection will do. Any pace is great, from gentle to sizzling, you choose. The #1 benefit people get from online rowing is motivation. Online rowers are a great bunch of people! The minute you try it you'll know: rowing with others is a very different experience from rowing alone. When you look across to the other boats and know each one is a live person rowing along with you on the RowPro 'crystal river', it changes the whole feeling of your rowing. You'll love it! Yes, it really is 3D! The beautiful 3D on-water scene in the RowPro display mentally lifts you out of your indoor environment and onto the sparkling water. Live water with oar puddles, boat wakes, surface ripples and moving reflections. Every boat is accurately positioned with rows of buoys every 10m along the course. You can color your onscreen avatar's skin, hair, clothes and boat to look just like you. Your initials are engraved on the bow flag of your boat. You can show your country flag on your precision 'big blade' Concept2 oar blades. Your avatar strokes when you do, giving an amazing feeling that it's really you out there. Apart from looking great, this has real practical value while you row. You can put a mirror on one side of you, and your computer on the other side, and you’ll soon see any differences and row better. Over a period of months, that makes a real difference to your rowing. A progress bar that maps out your splits and intervals, with a slider that moves along from left to right to show exactly where you are in your row. Two charts where you can monitor your pace and heart rate at every stroke while you row to check you stay in your target zone. A PM twin that mirrors the Concept2 monitor, enabling you to see two display modes at once, for example pace and watts. A stroke rate indicator on the top edge of the PM twin to check you're in your target zone. We've put a lot of work into making sure the RowPro in-row display gives you exactly the stimulation and feedback you need while you row. Our customers love it, and we're sure you will too. Row with pace boats, or past rows from your rowing log, or other people’s past rows. Past rows: Your own past rows are your best competitors. You can choose up to 3 past rows and put them in the lanes next to you to really spice things up. Pace boats: Quick pace boats that go the whole distance at the same pace and stroke rate are a breeze. Or to add interest, you can use RowPro's smart pace boats that can change their pace and stroke rate up to 20 times along the way. Rowfiles: During major Indoor Rowing Championships, the race computer collects data from all the Concept2 monitors. This data is later processed into Rowfiles and made available in our online Rowfile Library. Thousands of individual Rowfiles are available, each one a stroke-by-stroke record of a competitor's race. You can download Rowfiles free of charge and race them stroke by stroke. You can even mix pace boats, past rows and Rowfiles if you want. There's no more powerful, versatile and complete system for giving yourself the virtual competition you need to stimulate your rowing. © 2018 Digital Rowing Inc.